So, you want an espresso machine on a budget, but you want something better than the Delonghi budget machines? Well, you will have to open your wallet a little more. At $85 the Delonghi EC155 is hard to beat on price. But, if you are serious about your espresso, you will out grow it quickly. Enter the Gaggia Classic. Out of the box this “budget” machine will brew you a shot that puts Starbucks to shame (not that hard) and is miles better than most places that claim to serve Espresso. Work on your technique and use the right beans, and you’ll need to go to a serious specialty coffee shop to find a better product. This machine is small in size but big on performance. For starters, it has a commercial size 58mm portafilter. That means the coffee puck is going to be just like a pro machine. And, the portafilter is thick and heavy so it keeps the heat in the shot as well. Temperature stability is key to a great shot. And, baskets…the machine comes with 3. You get a single and double pressurized, and a double non-pressurized basket. The double non-pressurized basket is a normal, cafe espresso basket. You need a good grind/tamp to use it. The pressurized baskets are for use with pre-ground coffee. They will ensure the proper pressure is attained in the basket even without a good grind/tamp. Also, the single pressurized basket works as an ESE pod adapter. If you are like me, you will toss those back into the box and never look at them again. Next, the machine heats up really fast…like 2 minutes fast. This is both a pro and a con. It heats up fast because the boiler is tiny. But, on the plus side, you don’t have to wait 20 minutes to brew a shot. Wake up, turn the power on, put the dishes that your spouse yelled at you for leaving in the sink away, and you are ready to brew. It even has a 3-way solenoid valve to drain the excess water off the puck after the shot is brewed which makes clean up faster. Steaming is adequate with the included “panarello” style wand. But, thankfully, you don’t have to settle for that. A common mod (and one I did even before turning the machine on for the first time) is to replace the steam wand with the Rancillio Silvia v1 wand. This then gives you a pro style single hole steam wand. There’s plenty of videos on how to do this (just Google it…but follow one that does NOT tell you to cut the Gaggia wand apart…you don’t need to do that.) The steaming power on the Gaggia Classic isn’t amazing, but with the Rancillio wand mod, you can produce creamy latte art quality micro-foam very nicely. This is a single boiler machine, so you can’t brew/steam at the same time. So, you won’t be turning out high volume drinks for a dinner party, and you certainly can’t use this in a cafe. The water tank also isn’t suited to major volume, but is plenty big to handle several drinks for friends. Now, here’s the obligatory short talk about grinders. Buy the best grinder you can afford. 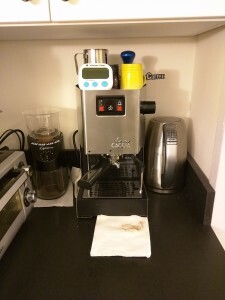 Even if you have a budget machine, a better grinder will work miracles on your brewed result. That said, if you are on a tight budget, this machine pairs very well with the Capresso Infinity grinder. On the negative side, the included tamper is a plastic joke. They give you a 58mm pro style portafilter, but a joke of a tamper. Pick up a real tamper at the same time and throw the plastic thing away. Also, the height between the portafilter and the drip tray is quite short. This means even getting a 6oz coffee cup in there is difficult. Only a true espresso demitasse fits…and even that is a snug fit. Also, the drip tray is a bit odd in assembly and it’s a tad small. Another misstep is that being a machine with a 3-way valve, it will require occasional back-flushing to clean out the valve and the group head. Curiously, Gaggia does not include a back-flush disc (blind filter) for the portafilter so you’ll need to pick up some extra supplies (brush, blind filter and some cleaner – like Cafiza) to keep your machine healthy. Depending on the other items you choose to add, you can be out the door for about $400. That’s much much cheaper than a Rancillio Silvia machine. At the end of the day, it’s what’s in the cup that matters, and the Gaggia Classic produces an outstanding espresso and can steam up rich creamy milk for lattes and cappuccino.